In a previous chapter you learned how to launch a specific activity in your app with an explicit intent. In this chapter you learn how to send and receive an implicit intent. In an implicit intent, you declare a general action to perform, and the system matches your request with an activity. You also learn more about Android tasks, and how you can configure your apps to associate new activities with different tasks. In an earlier chapter you learned how to start an activity from an activity by specifying the class name of the activity to start in an explicit intent. This is the most basic way to use an intent: To start an Intent or other app component and pass data to it (and sometimes receive data). A more flexible use of an Intent is the implicit intent. You don&apos;t specify the exact activity (or other component) to run—instead, you include just enough information in the intent about the task you want to perform. The Android system matches the information in your request intent with any activity available on the device that can perform that task. If there&apos;s only one activity that matches, that activity is launched. If more than one activity matches the intent, the user is presented with an app chooser and picks which app they would like to perform the task. An Activity registers itself with the system as being able to handle an implicit Intent with Intent filters, declared in the AndroidManifest.xml file. For example, the main Activity (and only the main Activity) for your app has an Intent filter that declares it the main Activity for the launcher category. 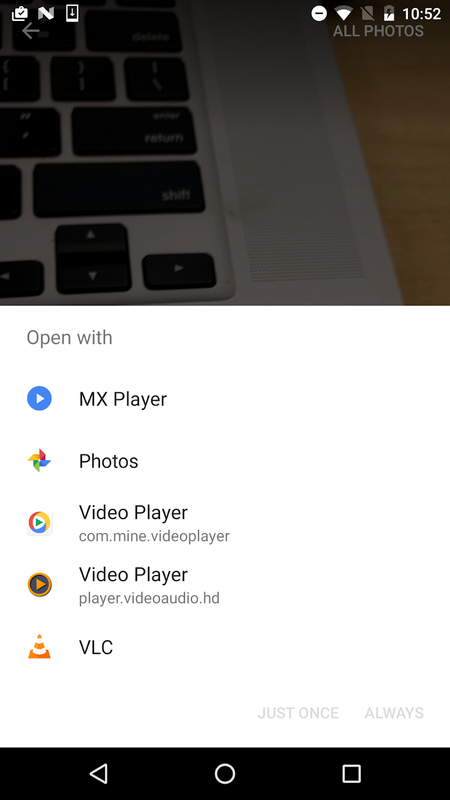 This Intent filter is how the Android system knows to start that specific Activity in your app when the user taps the icon for your app on the device home screen. The data type, which indicates the MIME type of data the Activity should operate on. Usually, the data type is inferred from the URI in the Intent data field, but you can also explicitly define the data type with the setType() method. Intent actions, categories, and data types are used both by the Intent object you create in your sending Activity, as well as in the Intent filters you define in the AndroidManifest.xml file for the receiving Activity. 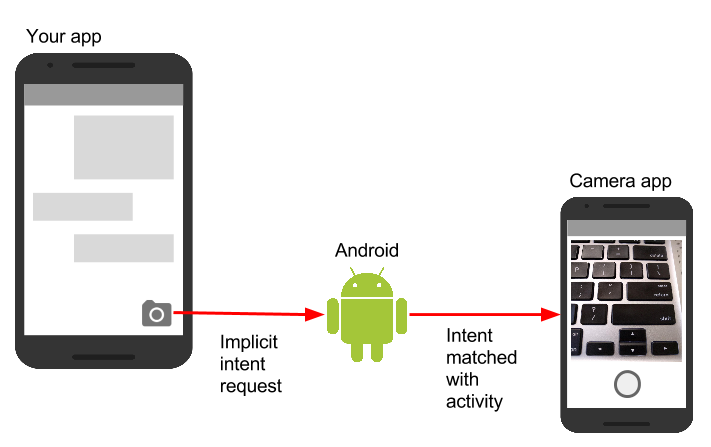 The Android system uses this information to match an implicit Intent request with an Activity or other component that can handle that Intent. When you define an implicit Intent with a specific action and/or category, there is a possibility that there won&apos;t be any Activity on the device that can handle your request. If you just send the Intent and there is no appropriate match, your app will crash. If you want an Activity in your app to respond to an implicit Intent (from your own app or other apps), declare one or more Intent filters in the AndroidManifest.xml file. Each Intent filter specifies the type of Intent it accepts based on the action, data, and category for the Intent. The system will deliver an implicit Intent to your app component only if that Intent can pass through one of your Intent filters. Note: An explicit Intent is always delivered to its target, regardless of any Intent filters the component declares. Conversely, if an Activity does not include Intent filters, it can only be launched with an explicit Intent. Define Intent filters with one or more <intent-filter> elements in the AndroidManifest.xml file, nested in the corresponding <activity> element. Inside <intent-filter>, specify the type of intent your activity can handle. The Android system matches an implicit intent with an activity or other app component only if the fields in the Intent object match the Intent filters for that component. <action>: The Intent action that the activity accepts. <data>: The type of data accepted, including the MIME type or other attributes of the data URI (such as scheme, host, port, and path). This Intent filter has the action MAIN and the category LAUNCHER. The <action> element specifies that this is the app&apos;s "main" entry point. The <category> element specifies that this activity should be listed in the system&apos;s app launcher (to allow users to launch the activity). Only the main activity for your app should have this Intent filter. You can specify more than one action, data, or category for the same Intent filter, or have multiple Intent filters per Activity to handle each different kind of Intent. Note that any Activity that you want to accept an implicit Intent must include the android.intent.category.DEFAULT Intent filter. This category is applied to all implicit Intent objects by the Android system. For example, this Intent filter matches any data Intent with a URI scheme of http and a MIME type of either "video/mpeg" or "audio/mpeg". Share actions are an easy way for users to share items in your app with social networks and other apps. Although you can build a share action in your own app using an implicit Intent with the ACTION_SEND action, Android provides the ShareCompat.IntentBuilder helper class to easily implement sharing in your app. Note: For apps that target Android releases after API 14, you can use the ShareActionProvider class for share actions instead of ShareCompat.IntentBuilder. The ShareCompat class is part of the V4 support library, and allows you to provide share actions in apps in a backward-compatible fashion. ShareCompat provides a single API for sharing on both old and new Android devices. You learn more about the Android support libraries in another chapter. In a previous chapter you learned about tasks and the back stack. The task for your app contains its own stack that contains each Activity the user has visited while using your app. As the user navigates around your app, Activity instances for that task are pushed and popped from the stack for that task. Most of the time the user&apos;s navigation from one Activity to another Activity and back again through the stack is straightforward. Depending on the design and navigation of your app there may be complications, especially with an Activity started from another app and other tasks. For example, say you have an app with three Activity objects: A, B, and C. A launches B with an Intent, and B launches C. C, in turn sends an Intent to launch A. In this case the system creates a second instance of A on the top of the stack, rather than bringing the already-running instance to the foreground. Depending on how you implement each Activity, the two instances of A can get out of sync and provide a confusing experience for a user navigating back through the stack. 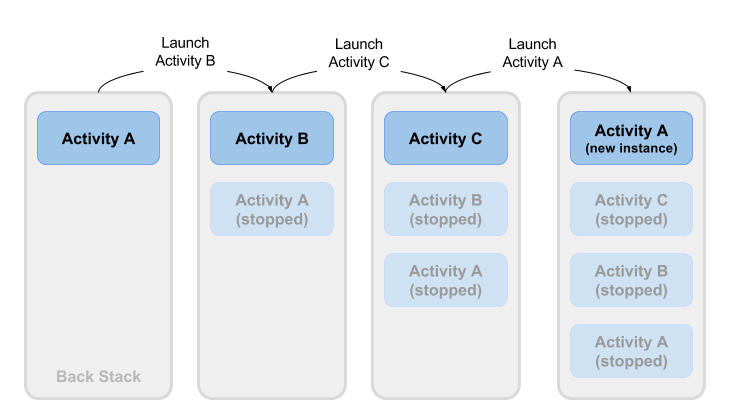 Use Activity launch modes to indicate how each new Activity should be treated when launched—that is, if the Activity should be added to the current task, or launched into a new task. Define launch modes for the Activity with attributes on the <activity> element of the AndroidManifest.xml file, or with flags set on the Intent that starts that Activity. To define a launch mode for an Activity add the android:launchMode attribute to the <activity> element in the AndroidManifest.xml file. This example uses a launch mode of "standard", which is the default. "standard" (the default): A new Activity is launched and added to the back stack for the current task. An Activity can be instantiated multiple times, a single task can have multiple instances of the same Activity, and multiple instances can belong to different tasks. "singleInstance": Same as single task, except that the system doesn&apos;t launch any other Activity into the task holding the Activity instance. The Activity is always the single and only member of its task. The vast majority of apps will only use the standard or single top launch modes. See the android:launchMode attribute for more detailed information on launch modes. FLAG_ACTIVITY_NEW_TASK: start the Activity in a new task. This behavior is the same as for singleTask launch mode. FLAG_ACTIVITY_CLEAR_TOP: If an instance of the Activity to be launched already exists in the back stack, destroy any other Activity on top of it and route the Intent to that existing instance. When used in conjunction with FLAG_ACTIVITY_NEW_TASK, this flag locates any existing instances of the Activity in any task and brings it to the foreground. When the Android system routes an Intent to an existing Activity instance, the system calls the onNewIntent() callback method (usually just before the onResume() method). The onNewIntent() method includes an argument for the new Intent that was routed to the Activity. Override the onNewIntent() method in your class to handle the information from that new Intent. Task affinities indicate which task an Activity prefers to belong to when that Activity instance is launched. By default each Activity belongs to the app that launched it. An Activity from outside an app launched with an implicit Intent belongs to the app that sent the implicit Intent. To define a task affinity, add the android:taskAffinity attribute to the <activity> element in the AndroidManifest.xml file. The default task affinity is the package name for the app (declared in <manifest>). The new task name should be unique and different from the package name. This example uses "com.example.android.myapp.newtask" for the affinity name. Task affinities are often used with the singleTask launch mode or the FLAG_ACTIVITY_NEW_TASK Intent flag to place a new Activity in its own named task. If the new task already exists, the Intent is routed to that task and that affinity. The related practical is 2.3: Implicit intents.